How can I add my Feedback? Click on the link Login/Register in the left sidebar menu, It will redirect you to the page where you can register (create user account) as well login after registering yourself. When you click on this link and you want to add your feedback, you have to register yourself. There is a User Type field in the user registration form, where you specify your Type and this is the base for your evaluation category i.e whether you are adding feedback for a Teacher, a Supervisor or a Clinician. The following is the graphical elaboration. Fill the registration form with valid values and most importantly with valid Email address because after submitting this registration form, you have to verify your email address i.e After submitting this form we send you an email in order to verify your email address validity, you have to sign in/login to your email and click on the link in the email received. After clicking the link your registration completes and you will be redirected to the page where you can add your Feedback. Now you are a registered user and you just have to login if you quit before adding your feedback or if you want to add another feedback next time. 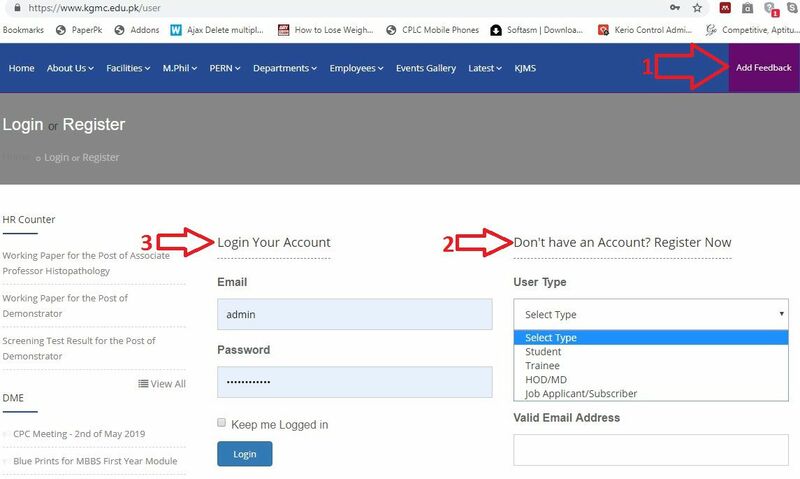 If someone does not receive the verification email (/Unable to login after registering), just send your Identity and Email Address on altaf.ahmad@kgmc.edu.pk, your account will be activated within next 24 hours. When you login to your account, you can see a link Add Feedback blinking. If you go to any other page after logging in and unable to find the feedback form, you just have to click on your First Name in the top menu. Students have option to add feedback anonymously without specifying Name and Class Number.